“There is no such thing as the last impression.” J.B. Miller didn’t mince words during a recent conversation with BizBash. Miller reminds us that great brand experiences imprint on our memory. They play on loop in our minds. We compare them to every other event we attend moving forward. Our goal as experiential marketers is not just to make an impression (first, last or otherwise), but to make the intended impression. The intended impression connects objectives to outcomes, and results in memories that last. How do we construct brand experiences that stay with attendees? Start at the end. – A nonprofit spotlights the moving story of a beneficiary during its annual gala. Attendees feel motivated to lend their time and money to the cause. – A beverage brand releases a new flavored sparkling water. Millennials flock to a colorful adult playground to snap pics while taking sips. – A fuel company sets up a donut stand amidst a popular morning commute. Brand ambassadors explain how leftover cooking oil can create more eco-friendly biodiesel. While every event is likely to achieve varying degrees of all three goals, one should dominate. In each example above, as with every event, the objective guides the outcome. Inspiration yields donations of time and money. Entertainment creates social media impressions. Education encourages people to boast their acquired newly knowledge. What’s best for your brand? Three important questions can help you decide. What do I want the audience to think? To feel? To do? 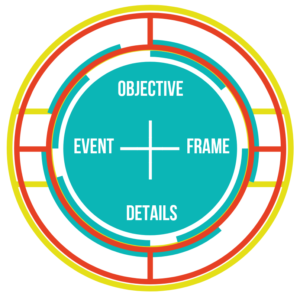 Allow your answers to shape the emotional narrative and the rational argument of your event. There you have the foundation and frame of your experience. After defining your event’s end goal, it’s time to take a good hard look at the potential audience. All marketing strategies benefit from audience research. But the process too often goes overlooked in experiential. Live events facilitate more direct interactions between brands and buyers than any other marketing method. Audience research is essential to success. If you’re not sure where to start, our guide to audience research can help. Lean into what you discover about your audience – and your objective – when crafting the participant journey. From invitation to exit, your choices of color, typography, and tone of voice have a significant effect on the mood and expectations of attendees. Consider how each detail – from music to refreshment, floorplan to staffing – work together to create your desired effect. It’s true, there is a lot to think about. If options begin to overwhelm, revisit your objective. Ask yourself, “How does this element contribute to my goal?” Every decision should have a purpose. If it doesn’t, it’s not adding value to the experience. As details come together, make time for a trial run. Whether you host an actual mock event or conduct the exercise in your mind, the goal at this stage is to walk a mile in the shoes of your expected audience members. Our Event Producer, Bobby Imperial, swears by this method. He envisions the experience journey first from his own perspective, then his mom’s, then through the lens of his high school principal. Miller also provides a great list of statements to complete for each attendee persona. I am _____________. _____________ is why I’m here. Through this experience, I’ve discovered _____________. I get interested by _____________. I will interact with _____________. I am motivated to share _____________. Great experiences offer something for everyone. But that doesn’t mean everything has to be for everybody. Take heart that certain individuals will respond better to different elements. The key is to identify where overlaps exist. Miller suggests mapping the positives in a Venn diagram. When you have one or two things in the center of your circles, proceed with confidence. An event does not end when the last guest leaves. Rather, it comes full circle. When all gets packed away, revisit your end goal once again. Did you achieve what you set out to do? What exceeded expectations? What fell short? For attendees and for marketers alike, there should be no last impression. The event should remain a living, breathing thing – a dynamic impression revisited for years to come.